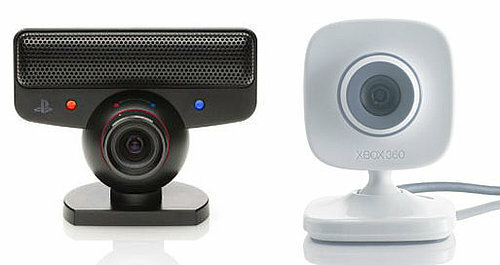 Do You Use a Console Camera When You Play Games? The first time I used a console camera was when my BF brought one home in a Trials of Topoq game bundle, which has you using body movements to direct a ball through a maze. Admittedly, it was the single nerdiest moment in my life, mostly because I’d never used a camera while playing a game before, but more so because the game was totally unlike anything I’d ever seen. Seriously, it’s pretty darn nerdy — just check out this review for proof. But now that more and more games are incorporating the Playstation Eye or Xbox Vision Camera into gameplay, I’m glad we picked one up when we did. SingStar just wouldn’t be the same without reviewing the snapshots and “Golden Moments” of me and my girls singing at the top of our lungs to Britney, and Little Big Planet wouldn’t feel like home without posting up “Polaroid Stickers” of us all over the game! Heck yeah — I use a console cam with a lot of games. No — I don’t like cameras in general! Huh? You can use cameras while you play games? Something else. See my comment below. This entry was posted in Gaming, Micropore, PS3, Sony, Technology, Webcam, Xbox 360. Bookmark the permalink.